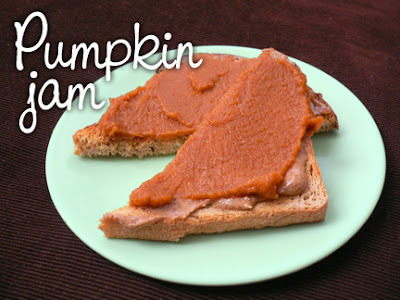 Have the treat of pumpkin pie anytime with this easy-to-make spread! Pictured here on kamut toast with a layer of walnut butter. Combine pumpkin, juice and spices in a large saucepan; stir well. Give it a taste and sweeten as needed. * Bring mixture to a boil. Reduce heat, and simmer for 15 minutes or until thickened. Stir frequently. Makes lots! Great on toast, biscuits, pancakes, etc. Can for yourself or pour into small decorative jars to give as seasonal hostess gifts. *Or use 1 1/2-2 cups of your own cooked/baked/steamed pumpkin, pureed. *Choose natural sweeteners like honey, maple syrup, brown rice syrup or agave syrup. If using honey, choose unpasteurized and stir in after jam is cooked and cooled down slightly. FOR CANNING: Spoon hot pumpkin mixture into hot, boiled jars, filling to within 1/4 inch from top. Remove air bubbles by firmly tapping jar on the counter. Wipe jar rims and cover tightly. Finish off by processing in a boiling water bath for 10 minutes. Or, simply spoon into an air-tight jar or container and store refrigerated for up to a month. Jam looks so beautifull..How is your baby? take care of you. I am so glad that I found this blog! I am a Holistic Nutritionist and Clinical Herbalist...I will recommend this site to clients. Thanks so much for seeing the body as a whole unit, which, if balanced, remains healthy. I also take issue with "weight loss diets" and "cardio yoga for fitness". We whitewash the meaning out of so much of what we do. Thanks again, I'm very impressed. P.S., I'm also a Vata who struggles with a few extra pounds now and then. I have an endocrine issue that has resulted in a thyroid issue, and have found that endocrine issues can often be attributed to too much Vata. Ayurveda, among a few other things have helped me to maintain a healthy weight with a balanced system. In fact, I find that with endocrine issues, Ayurveda really shines. Do you mind if I link your blog to my blog? Ananna, I'm so pleased you're enjoying my blog -- I'm happy to share, and do feel free to link to your blog. Hope this path helps you with your Vata/endocrine issues! This was fantastic. Thanks for the recipe!